Railroads like CSX are a logistical work of art. Without them you simply wouldn't have as much stuff. CSX Corporation (NASDAQ: CSX) is a vital cog in the economic food chain. It takes products from where they're made or enter the Untied States to where they're needed, and importantly, it does so at a very low cost. But there's more to understand here than just that. Here's a five-minute guide to CSX stock. On the surface, a railroad like CSX may seem like a simple business. And in a way, it is -- pick stuff up and deliver it to another location. However, there's more going on than this. For example, railroads travel on tracks. You know that, of course. But it costs a lot of money to put track down and maintain it. Moreover, trains are also expensive items. So CSX operates in a highly capital-intensive industry. This is important on a couple of different levels. First, CSX competes with other railroads such as Union Pacific Corporation (NYSE: UNP) and Kansas City Southern (NYSE: KSU). While there's overlap in some service areas, these companies have something of an oligopoly going on. It's just too hard to build a new railroad from scratch. But competition between the companies has to involve cooperation, because no single railroad covers the entire country. So it's a complex brew, and the major railroads have some notable protections and interdependencies. The second reason the capital intensive-nature of railroads such as CSX are important is that scrimping on maintenance is a sure way to hurt the business. If equipment starts to break down or shipments get delayed, customers get angry. Then they start looking for other options, such as trucks. That said, sometimes there's no choice but to spend. For example, although cutting corners wasn't at issue, reliability was a big problem for the railroads back in 2014, when the United States was hit with the so-called Polar Vortex. All of the railroads had to spend heavily to repair their lines and get backlogged shipments delivered after this extreme weather event. It was more than just a costly episode, it was a black eye for an industry where reliability is key. In 2013, CSX's trains left "on time" roughly 85% to 90% of the time. In 2014 that number fell from roughly 65% in the first quarter to about 50% in the fourth quarter. "On time" arrivals in 2013 were between 75% and 85%, but in 2014 the high was 51%. So when you look at CSX, you need to take into consideration the spending that railroads can control and the spending that sometimes gets forced upon them. Another factor that's totally out of a railroad's control is the economy. In fact, CSX could be the best run railroad in the world and it wouldn't matter if its customers simply didn't need to ship things. That happens to be a big issue today and helps explain why CSX and its peers have seen so much price weakness. CSX breaks its business down into 11 different categories, such as grain and coal. In 2015, volumes shipped in eight of those categories fell year over year. Of the remaining three categories, two saw a deceleration in growth. Only Automotive managed to grow at an increasing rate. That's been the story at most of the railroads. For example, Union Pacific saw declines in five of the six categories it breaks out, with the sole bastion of strength being the auto sector. 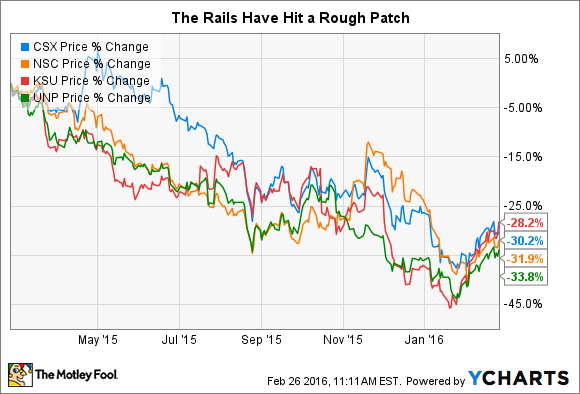 And most of the railroads are painting an ugly picture for 2016. But that's not the real takeaway here. The important point is that demand for a railroad's services will wax and wane with the economy. Right now that's not such a great thing, but in other periods it will mean robust volume growth across most, if not all, of a railroad's business lines. That said, coal is an issue to watch, since this is an important but shrinking business for the train lines. Counterbalancing weak coal volumes in recent years has been intermodal and oil, but if other areas don't pick up the slack, coal could be a trouble spot that changes the broader economic picture a little bit. So CSX operates in an economically sensitive and capital-intensive industry. In other words, there are a lot of things out of its control. That's why it's so important for you to keep an eye on the things it can control. On that score, you'll want to pay attention to CSX's operating ratio. Essentially, this is operating expenses as a percentage of revenues and gives you an idea of how well a railroad is running its business, with lower being better. CSX's operating ratio was 71.5% in 2014. It manged to lower that figure to 69.7% last year. And its goal is to get into the mid-60% range over the longer term. That's not bad, with Norfolk Southern's 2015 operating ratio a much higher 72.6%. But it's not great, either, with Union Pacific posting an operating ratio of 63.1% last year. The big picture here is that CSX is doing a decent job of controlling the things it can control in a difficult market -- but it still has room for improvement. So that's the quick guide to CSX stock. In the end, running a railroad well takes a fair amount logistical wizardry to ensure that you have the right assets in the right places at the right times. The ideal, of course, would be volumes going up, reliability at high levels, and the operating ratio at low levels. But the ideal outcome is pretty rare, which is why you'll want to pay attention to a each of these factors if you own or are interested in CSX.